Vikas Mehta, MD, MPH, FACS, is an Assistant Professor of Otorhinolarnygology at Albert Einstein College of Medicine. His clinical focus is on the treatment of patients with head and neck cancer, diseases of the salivary glands, and thyroid/parathyroid disease, with a particular interest in transoral robotic surgery and minimally invasive endocrine surgery. Dr. Mehta received his Bachelor of Science in Molecular Cell Biology at the University of California Berkeley in 2001. In 2006, he received his Doctor of Medicine at the University of California Irvine. 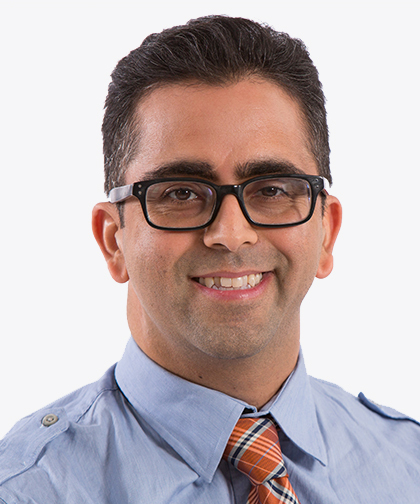 Dr. Mehta completed an internship in General Surgery at St. Vincent’s Catholic Medical Center in 2007. He then completed a residency in Otolaryngology at the New York Eye and Ear Infirmary. In 2012, he completed a fellowship in Head and Neck Surgical Oncology at the University of Pittsburgh Medical Center. He also attended Johns Hopkins University where he received his Master of Public Health in 2015. Currently, Dr. Mehta is interested in researching the clinical outcomes in head and neck cancer patients, and patients with thyroid conditions, looking particularly at health disparities, cost effectiveness, quality of care, and systems improvements. His previous work on a range of topics has been published in many peer-reviewed journals and books, as well as presented nationally and internationally. numerous professional societies, including the American Head and Neck Society, the American College of Surgeons the American Academy of Otolaryngology Head and Neck Surgery and the New York Head and Neck Society.